MB&F — the Swiss-based watch brand known for its out-of-this-world designs — has launched yet another magnificent timepiece that will take any wearer’s breath away. Inspired by jellyfish, one of the world’s most magnificent nautical creatures, the HM7 Green Aquapod joins the rest of the collection comprised of blue and red gold designs. This timepiece boasts an aesthetically pleasing design that will undoubtedly tantalize the mind of any chronometer connoisseur. 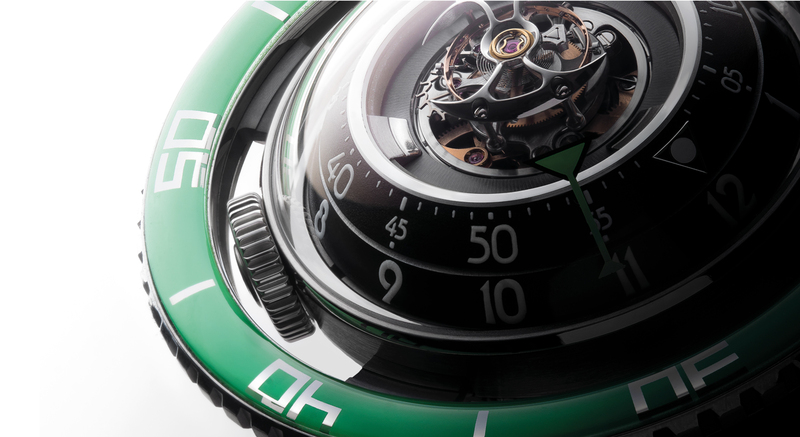 Vibrantly colored, the green sapphire bezel is the main focal point of this astounding timepiece.Its 60-second flying tourbillon protrudes out of the center of the watch like the dome-shaped head of a jellyfish, so wearers can gaze at its mechanical perfection. All 303 engine components work together seamlessly, a system that was developed in-house by MB&F. The 35 jewels embedded throughout the piece enhance the HM7 Aquapod’s aesthetic even further, allowing this watch to be both functional and a work of art. Perhaps one of the most eccentric aspects of the HM7 Aquapod is its glow-in-the-dark capabilities. At night, this timepiece illuminates the numbers, the tourbillon and the winding rotor. This impressive detail takes the HM7 Aquapod to new levels, allowing for its artistry to be fully appreciated. Other magnificent details of the timepiece include its power reserve of 72 hours, water resistant capabilities up to 150 feet, its two crowns, and its rubber strap fashioned from aircraft-grade Flurocarbon FKM 70 Shore A. 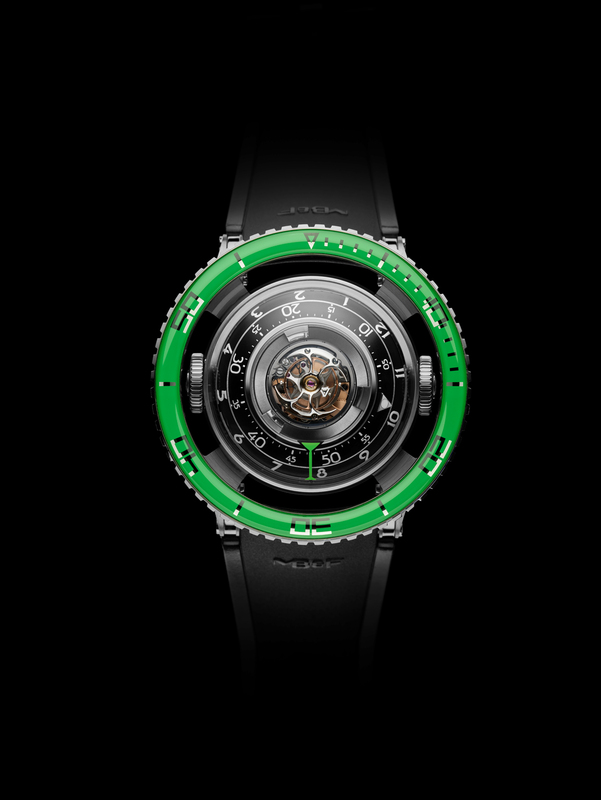 The HM7 Green Aquapod is, in fact, so rare that MB&F only constructed 50 pieces worldwide. The other two editions are also limited quantities of 33 pieces (blue ceramic bezel) and 66 pieces (red gold). 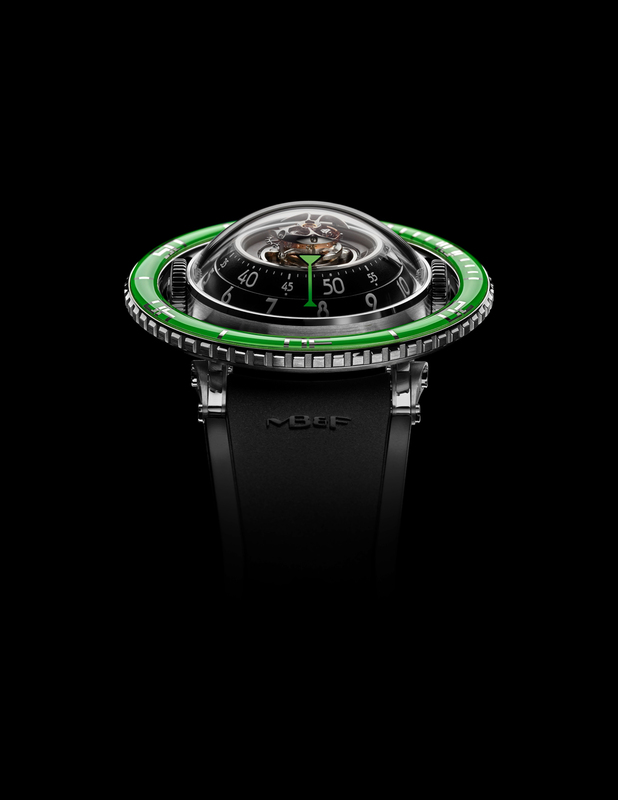 For more information on the HM7 Green Aquapod, visit www.mbandf.com.